In the apparel export business, garment exporters get lead time from buyer’s end for shipping finished garment. Sometimes buyer gives fixed lead time for their orders or buyer asks suppliers to decide best possible lead time and they mutually agree a date for shipment. Shipment lead time may vary depending on order volume and product line. This post covers what does lead time means to a supplier and how to calculate lead time for an order. What does lead time mean in an export order? It is the time duration from receiving an order to shipping it to buyer. Normally ex-factory date is considered as shipping date. Lead time is expressed in number of days. Example, if a factory received an order on 1st of January, 2016 and buyer asked to ship the order on 31st March, 2016. Here order lead time is 30(Jan) + 29(Feb) + 31(March) days = 90 days. Prior to order confirmation buyer may not mention the ex-factory date (lead time) to a supplier. Instead they ask supplier to calculate and propose a lead time based on order quantity, process time and supplier production capacity product development time and material sourcing time. If this is the case, how do you calculate lead time of an export order? How to calculate lead time? Step by step lead time calculation method is explained below. Step#1: Make the list of processes and events you need to do completing the order. The best way to do this is by preparing a Time and action calendar (TNA). TNA template would help you quickly make the activity list and calculate the lead time. You should also have holiday calendar of your country as well as buyer’s holiday list while you are calculating for lead time (preparing TNA calendar). Step#2: Map process time for all processes. Holidays in between process time. For some events (like lap-dip, sample approval) which are external process you may need to take process time for these from buyer/supplier. Read this post to calculate capacity of stitching process. Step#3: Check sourcing lead time for various materials from your supplier. Take commitment from supplier for material delivery. According to sourcing time plan your PCD date. You need few days for fabric approval before starting bulk cutting. Step#4: Identify critical processes for the given order. Prepare critical path for all processes and events. This is important to understand which all processes can be done parallel and which all process can’t be started without completing previous process. Consider overlapping of multiple processes and working on multiple processes in the same time period. This way you can reduce lead time. Step#5: In the TNA calendar write start date and completion date of all processes. Thus you will get finishing and packing completion date of the given order. You can overlap production processes. Like, if you need 5 days for cutting process, you can start loading production in same day or next day of cutting start. Similarly for stitching you need 10 days but you can start finishing process when production pieces start coming out from the line without waiting for completing stitching for whole order. This way you can reduce production lead time. From the above you have order receiving date, production completion and finishing completion date. Count days required to reach from one event to next event and mark dates for each event. Write start date and completion date of all processes following critical path. To get total duration in between order receiving and shipment date count total days from order receiving date to shipment date. You got lead time for the given order. 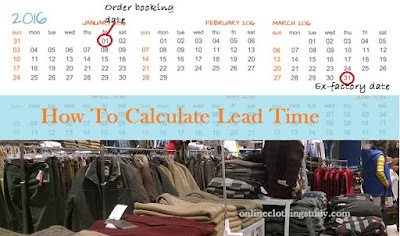 Lead time in garment export business, TNA, Lead time estimation.